Many pundits have accused the MLS Benchmark as a pricing algorithm designed by the real estate board to formulate prices which keep the public in the dark. While I’m not entirely convinced, there are definitely some inconsistencies that make the MLS benchmark unreliable in a fast pace market. Never has there been so much uncertainty regarding prices and so much public demand for more transparency. Price transparency hard to come by in Real Estate. So what does the public rely upon? The MLS benchmark, average, or median prices? Just last week we discovered the MLS benchmark was off by as much as 5% in September. Hardly a minor mistake in this crazy and fast pace market. So what’s the deal with the MLS benchmark? (You can try to understand their formula here) Here’s where things get interesting. 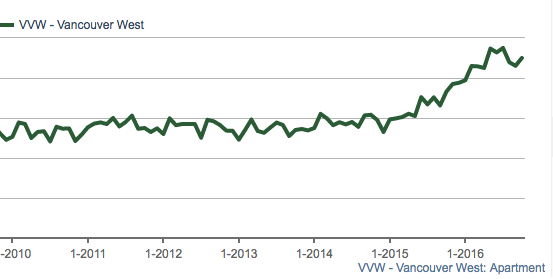 According to the benchmark, detached home prices in Vancouver East peaked in September. But we all know that isn’t true. Even most Realtors would have told you prices were down about 10% in September. Yet as of the end of October the benchmark shows East Vancouver prices are down 1.3% from September. Yet the average price shows prices peaked in July and are now down 8%. Median price shows prices peaked in June and are now down 13%. Just last week of the 20 price changes in Vancouver East, the average reduction worked out to $88,469.95. That’s another 6% off the October benchmark price. The benchmark shows big flaws in the detached market. Even more so when there is little inventory. Let’s look at an area like Tsawwassen. From January 2016 to October 2016 the benchmark shows prices are up 20%. While the median shows prices are down 17%. As per my conversations with Realtors there they estimate prices are down 15-20% after peaking in the spring. Talk about inconsistent. Where I will give the benchmark the most credit is in the condo market. Because there’s usually lots of inventory and most of the inventory is roughly the same you can see that it reflects more closely with median prices. The benchmark price for condos tends to fluctuate more compared to the detached market which basically just shows a long term trend. Here the benchmark shows Vancouver West condo prices peaked in July and have since corrected 2.5%. 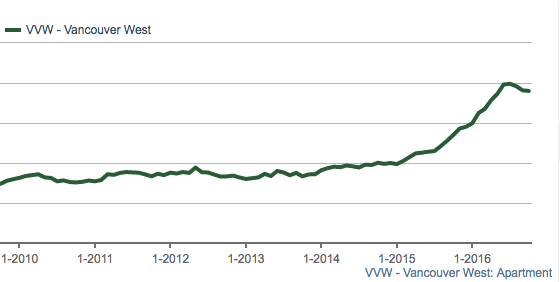 The median for Vancouver West condos show prices also peaked in July and have since corrected 3.7%. Fairly similar to the MLS benchmark. There’s no perfect system. The average can be skewed by the type of inventory which gets sold for that specific month and fluctuates tremendously. The median can also fluctuate on a monthly basis but not nearly as much. Then there’s the MLS benchmark. Which I believe was designed to show trends. It appears to lag as much as 6 months for the detached market. However it tends to be much more accurate in the condo market likely due to the similar inventory and the greater number of transactions. When looking at prices in the detached market it’s best to use the median and follow up with a Realtor to gauge what they are seeing on the ground….and hope they give you an honest answer!